Millions of Americans experience pain every day of their lives, their conditions unalleviated by the myriad medications and treatments available today. Maureen Pratt, who has had lupus for more than a decade, is intimately aware of the toll chronic pain takes on patients and their families. ^In this practical and spiritual guide, she shares how she navigates through the frustrations, fears, and complexities of living with chronic pain and illness. ^Using a combination of Bible passages, her own observations and insights, and prayer, Pratt provides help on issues that include dealing with isolation, coping with medical expenses, and learning to say no. 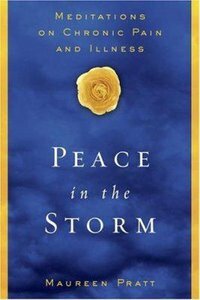 Written with unstinting honesty and humor, "Peace in the Storm" will help readers identify their own spiritual and physical needs. About "Peace in the Storm"
Maureen Pratt has served as an ambassador for the Arthritis Foundation Southern California Chapter and is a founding member of Lupus L.A. She works with the Lupus Foundation of America to promote patient education and is a speaker on faith, prayer, health, and living with chronic pain and illness. She is the co-author of "Taking Charge of Lupus "and the author of "The First Year--Hypothyroidism. "She lives in Los Angeles, California. I and not some foreign god among you. The first days and weeks after being diagnosed with a serious, chronic medical condition are full of questions. Indeed, it is almost as if we have become children again, having to learn how to live by a new set of rules and how to exist in a new and frightening world. This parallel continues to the questions we ask, chief among them, "Why?" We try to think of whom or what we might have come into contact with that would have infected us, or what mix of genes and environmental factors combined to bring about our illness. Was it something we ate? Something we did? Something someone else said, did, or didn't do? We comb through medical information, looking for answers. And we lift our queries to the heavens, asking God, as our Father, the same question we posed to our parents who told us to do things we didn't want to do (like chores, or sharing a toy). "Of all the people on the face of the earth, why did this illness strike me? Surely others are less diligent about keeping healthy. Surely others have more time to be ill. What about my faithful following of your teachings, Lord? Doesn't my belief in you give me an edge over those who have fallen away or, worse, have refused to listen to you? And, if you had to bring illness into my life, why did you give me something so terrible? A cold, a few headaches, the gentle physical manifestations of growing a bit older--these I would have borne in relative ease. But this? My Lord, because of this illness, my life has been turned upside down. Oh, it's true that I haven't been feeling well for a while. But my plans for the future, my careful financial planning, my close relationships are all affected by my malady. And for what purpose? Truly, before this illness, my life was going along so well! Why me?" We wait for a response from the Lord, but his answer eludes us. So, we keep asking, just as we did when we were children. But remember what our parents used to say in response to our questioning their requests? It might even be what you say to your children under the same circumstances. Certainly, it's the answer that God provides us with now. Indeed, God does not have to reveal his reasons for drawing us down the path we're on. At least, not yet. He is omnipotent, over all things, including ourselves. He is the ultimate parent, his way is the highway. And he wants us to allow him to lead. The more time we spend questioning his motives, the less time we will have for embracing the experiences and insights reserved for us by the Lord. In this reading from Isaiah, God says he has chosen us to be his witnesses. How wonderful that we are chosen by him, loved by him for our whole lives! His special witnesses, in spite of, along with, our life-altering illness. Can we, then, mistrust him? Question the way he is working in our lives? Anything that comes from God is good. And by our faith, our trust in him, our triumphs over adversity, and our love, we are living proof of this. Father in heaven, you know the questions that weigh heavily upon my heart. help me move from childhood to maturity about my illness. proclaiming to all that you are God. and my groans well forth like water. and what I shrink from comes upon me. I have no rest, for trouble comes! Accepting a diagnosis of serious illness is like peeling a pungent onion. Even as we take off the layers of doubt, disbelief, and refusal to accept, our eyes well up with tears and our fingers tremble. The onion is an unsettling element, being added with much discomfort to the stew of other ingredients that make up our lives. The task becomes exceedingly painful, even excruciating, the longer we peel back the layers and drop them into the mix. We'd rather do without it. But at this moment, our life's recipe calls for a complete onion, and we must continue. When we reach the onion's core, finally, we are able to dry our tears and turn to the meal at hand. So, too, after we can fully accept our diagnosis, we can cleanse our hearts for the time that lies ahead--the time of tasting the onion-flavored "stew" and benefiting fully from the new and more healthful concoction that will nourish us in the days and years ahead. Before I was diagnosed with lupus, I held the firm belief that whatever was wrong could be dealt with quickly and effectively. I remember facing one doctor and saying, "So, you'll give me some medication and I'll be fine, right?" I truly had no idea how serious lupus was, nor did I fully realize what the diagnosis would mean to all aspects of my life. Looking back on those first few weeks of coping with all the information I learned about lupus, as well as the seemingly endless (and often painful) tests I had to undergo and the medications I had to purchase and start taking, I realize that I didn't want to "fully realize" everything all at once. Indeed, accepting my diagnosis of lupus took a long time. During that period, I did a lot of sighing and groaning as I adjusted the many facets of my life to accommodate the changes lupus brought to them. When I could no longer hide my hair loss, I bought a wig, threw it on the floor in disgust when I couldn't immediately fit it on my head without thinking it looked fake--and picked it up, brushed it off, and tried again. I insisted upon pushing through excruciating lupus fatigue in an effort to somehow prove that it could be conquered--and discovered it could not. I told people I was "fine" when I really wasn't--and felt resentment when they weren't as sympathetic as I thought they should have been. During this journey with lupus, I have learned that some amount of denial can be surprisingly healthy in the immediate wake of a diagnosis. If we accepted the complete scope of serious illness all at once, we might fall into a shock so profound that we'd be unable to move along toward a more healthful life. So, instead of being overwhelmed, we peel back the onion, feeling the sting of the tears as we do so, and accept our diagnosis piece by piece until we are able to accept it all--and be the better for it. O Lord, please help me in my unbelief. let me be ever mindful of your hand upon me. Do not be afraid or discouraged, for the Lord is the one who goes before you. He will be with you; he will neither fail nor forsake you. Imagine you are hiking with three of your loved ones in a dense mountain forest. The trees--birch, pine, and oak--are so thick and rise so far above your head that they obscure the far-off sun. Beneath your feet, the uneven ground is strewn with rocks, withered pine cones, and thick tree roots as it spirals upward, making your way dangerous, even though the path is well defined. Here and there are marvels of God's handiwork: a waterfall cascading down an embankment and into a rippling river, a delicate eggshell blue wildflower peeping out of the crevice of a rotten log. There are forest birds, too, whose songs fill the air with shrill music. And beyond all this, at the end of the path, you are sure there will be something even more marvelous than this gentle unfolding of nature. Suddenly, midway up a steep part of the path, you hear a sharp crack. Three forest birds streak across your view and away from the disturbance. You think of mad dogs, bears, and wolves. Your heart fills with fear. But before you can reach out to your companions for safety, two of your loved ones run away, disappearing rapidly down the path, and the third scoots up a nearby tree. In moments you are standing alone, with the sound of something terrible getting closer with each passing second. The feeling of utter loneliness is a bitter, fearful sensation that there is no one to turn to, no one to be with you at your time of need. When you were diagnosed with your illness, you might have experienced this. Perhaps a trusted loved one didn't believe your diagnosis or accused you of doing something to bring it on. You feel a rift now, at a time when you most need the comfort and safety of a friend. After your diagnosis, you continue to experience loneliness. People you thought were friends move away from you, especially as your illness makes it more difficult for you to be energetic and sociable. Your spouse becomes physically and emotionally distant; as your body changes and the illness affects your appearance and personality, he or she might even begin to wonder if the marriage will stay together. This insecurity about your future, even if you took vows of "for better, for worse," can be terrifying. Not only do you feel lonely in the moment, you fear a future of a marriage promise broken, a trust betrayed. Loved ones are not the only ones who might move away from you. Coworkers resent your illness because they have to do your work as well as theirs when you can't be productive. They separate themselves from you and you become isolated at work. Some animals prey on the weakest among them; it seems as though some people want to figuratively treat you that way, too. From insurance battles to getting the wheelchair to come to the airport gate when you arrive, you always seem to be alone and vulnerable. In your illness, pain, and fear, you feel more than loneliness. You feel desolation. On the mountain forest path, alone and afraid, you are angry that your friends have deserted you. But do you allow your mind to go blank from fear, anger, and resentment? At this very harrowing crossroads, you have a choice to make. If you want to continue in stark loneliness, you will continue to dwell on it, let it chase you down and tear you apart. But if you want to forge your courage in the face of adversity and rise above despair to someplace better, you need to call upon something deeper and closer to your heart and soul than your very human loneliness. You need to call upon the Lord. Look inward and breathe deeply. Ask for strength. "Do not be afraid or discouraged, for the Lord is the one who goes before you. He will be with you; he will neither fail nor forsake you." The Lord is more powerful than all our fears combined. He created you and me. He is with us through everything, through every step on our journey to the summit of the mountain. Out of human fear, your loved ones have run from the unseen peril that is closing in. You cannot run from it, but you can face it with the courage that comes from belief in the presence of God in your life. By your courage, you will show your loved ones and everyone you meet that you have no intention of letting your illness separate you from the creation God has made and from your beloved friends, family members, and colleagues. Staring down the monster, you intimidate it and it slinks back into the forest. You shout for your loved one to come down from the tree. You reach out to the other two companions who have run away. You tell them, "It's all right. We'll be safe. Come, let's continue on." And so, you do. Soon the forest gives way to a smooth slab of granite forged from centuries of upheaval and weathering. The view is spectacular! Miles and miles of glorious azure sky and brilliant sun, deep green trees and glittering waterways. It is the earth. It is life. It is peace. And you made it here because you trusted in God to take away your fear, your loneliness. He has given you this wondrous gift of living to enjoy in spite of your illness. By his grace, you do. And, best of all, you share it with your loved ones. Lord, there is an emptiness in me that cries out for you. as if the whole world has abandoned me. Take away my despair and let me feel your comforting hand upon me.